Would Online Sellers Prefer USPS Robots to Mailmen? "Ding! That sound could soon be the USPS app alerting you to an imminent delivery, after which a driverless Postal Service vehicle arrives at your door and a robotic arm delivers your package." The concept of robots delivering mail seems as farfetched as driverless cars, but the latter is already a reality thanks to Google, as explained in this Economist article. Wall Street is already putting a number on the market for such automation technology, and the consensus is that driverless cars will be on the market within the next 5 years. But getting back to mail delivery (and pickup) - could the USPS capitalize on driverless vehicles? And is the next step really replacing mailmen with robots? Imagine Roomba vacuum cleaners turned into intelligent mail delivery robots. Would it be a plus or minus for online merchants - would it make your life easier? And why stop there - what about postal clerks being replaced by robots? The USPS would capitalize on having robots in upper management. Absolutely. This is the rare case where I'd rather deal with a machine that a postal worker. If you ask three different postal workers the same question you will get three different answers that are not even closely related. Every now and then I get a human at USPS who is energetic and knowledgeable, but it is quite rare. I'd much rather use the self-service machines at USPS than to deal with one of their workers. I must in the minority. Over the years I've had extremely positive experiences with the vast majority of USPS clerks and carriers. They've helped me locate misrouted parcels,m given me straight answers to question including admitting they didn't know the answer. The ones I come into contact daily are great with the exception of a new contract carrier who is lazy. He replaced a young lady who was so good she got on full time with USPS. I think we should keep in mind that many USPS employees have many of the same problems we do as ebay sellers and treated as badly not only by their own management but by Congress as well. Many lost their jobs this years, and many now have to make very long commutes to work in other cities than where they live. We as a country are going to get the USPS we deserve. Unless we speak up -- and very loudly -- the Republican plan to destroy the Post Office will succeed. It's going to take some extremely sophisticated programming for robots to replace clerks. When I visualize driverless cars and robotic arms, why do I think of ebay management? That's simple. A robotic right arm simply has no clue at all what the left robotic arm is doing. 100% perfect description of eBay management. Robots following blindly down along the garden path after Donuthole's disruptive stupidity, with no integrity/intelligence/gumption of their own - and no idea of what is going on elsewhere in the company. And all by design. As usual, you've nailed it on the head! I am also in the same boat as you with respect to my own experiences with USPS personnel. 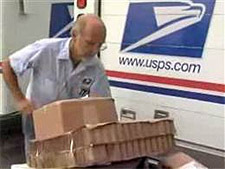 At one point about 15-20 years ago, I had opportunity to interact with literally dozens of different USPS personnel on a weekly basis, clerks, carriers, management, both in big cities and small, nothing, roadside stand/telephone booth sized post offices, and never ceased to be amazed at how helpful, friendly and on top of things they were as a whole. There'll always be one broken crayon in the box, but by and large, the others aren't. The one and only sour spot I've ever had with USPS was my local rural route carrier at my house for about 10-12 years. The man was slow as molasses in January, constantly making mistakes, etc., drove me crazy. In his defense, however, he was a very pleasant man to talk to and could literally talk your ear off (which, yes, is one reason he was SOOO slow at his job...). He also was not a healthy person at all, and should have been on total disability YEARS before they finally relented and let him do so. For my vote: I'd rather have the clerks! They'd never reject a package for being .030'' oversize like a mail-roomba would, only because the package loaded on the weighing tray a little crooked. Or charge my customer the difference between a 24lb Medium Flat Rate box and straight Priority Mail 24lb box, only because a spec of dust/glob of dirt got on the lens that scans the box for the bar/QR code telling them it is a FR1 Flat Rate box, and not finding that code. A human will see what a machine can't (or won't). I blame management (and Congress' pre-payment requirements) for the USPS's woes. As it is, our carriers and clerks are *already* human robots who do as they're told. With better management, and with better training (and freedom to use their brains) our carriers would likely perform at at much higher level than they do now. I'm with Ming... the major problems with the USPS are not the fault of the rank-and-file carriers. Most of them are doing the best they know how to do, based on the information (and training, and responsibility) that's been given to them. --- Many of them are sharply aware of the organization's shortcomings and flaws... yet they feel compelled to remain silent and not make-waves, for fear of reprisals. They, too, fear the possibility of losing their jobs, so (based on conversations with my mail carrier) most of them choose to lay-low and stay under the radar. Definitely no robots. That would just be 1 more bad idea from the USPS upper management. The workers at the post office are great; the problem is upper management. I wouldn't mind robots, but I'm also a technology geek who has actually written software for machines, so I have a bit of a different perspective. My local PO personnel are excellent, so I can't complain there. I disagree with Ming on one thing, though. I think *both* of our current political parties (at least the members of them currently serving in Congress) are useless and should all be replaced. There's also too much management bloat in the USPS to make it efficient. Robots might be helpful and save money, but would be replacing the wrong part of the problem (lower level workers instead of management). I would like to see more automated package drop-off capabilities in existing post offices. It's not always easy to get to the PO when it's open, especially when one has to work a day job in addition to selling online. I prefer better trained and courteous postal workers over robots. My biggest complaint is with the rudeness and laziness I have experienced with local workers. It seems there is no happy medium here with USPS employees either being exceptional or downright rude. It probably depends on the city or section of town. I have close friends retired recently from the post office and were appalled to hear how I was treated a while back. They told me I should report the worker but I just let it go. There were a few carriers I really miss over the years but the post office is constantly changing carriers to where I don't even know if there is a regular carrier on my route. The post office is becoming very impersonal and seem to want their employees to act like robots. Form purposes of clarity, it was during the Bush administration and a Republican dominated congress when the USPS Homicide Bill was passed and signed into law. Its purpose was to deliberately put USPS out of business so that the vultures of venture capitalism and competitive shipping corporations could get their greedy corporate fangs on the USPS carcass. Overall, I've found carbon-based life form Postal employees an asset. Remember, the USPS has "Kiosks" in some facilities - 95% of customers belly up to the counter even if there are lines. I've used it a couple of times with mixed results. Let's say carbon-based life forms are quicker and can anticipate your needs - they even recognize you. Dave, Dave - just a moment, Dave. The Royal Mail Service is being privatised! Let's see how those wankers will do. I think, on this side of the pond we don't want to get into that mess. I meant "capitalist wankers" - not the employees who will get free shares in whatever corporation takes them over (but can't cash out until 3 years later). The women at our small Post Office are great! They work hard, and do a good job. Live people can solve problems. Too much of our lives now are automated by technology, which leads to frustration, because you can't get an answer or a solution to a simple problem. Look at Ebay CSRs. They act like robots, and are incapable of solving problems. If everything is run by robots, what are people going to do to make a living? We can't all be software engineers. I'll pass on the robotics for sure. Yes, too much automation is in use as is and it does cause major frustrations for large numbers of people each and every day. Remember the days when you called a company and got an actual person instead of automated message system? Now days you get to choose between three of four choices then they want you to go to their web site and read their FAQ. Of course, the reason you call is because you need something other than how to make a payment or look up you order/balance, etc. Automation and robotics are frequently programed with limited choices, they offer what us important to them, not you the customer. We need real people and the people need real jobs. If they privatize the USPS, they will become just one more UPS/FedEx where their main goal is to break last years record profits with this years record profits. I'd prefer a robot eBay CEO. Yes, Ming is right- I would like to see how well ups and fed-ex would do if they had to pre-pay retirement on workers who have not even been born yet- this WAS done to neuter the USPS. As for robots at usps- could we put jd in one of those robot cars and schedule a delivery off of a cliff? I would find that useful. Yeah, well... if they DO go to robots. I call dibs on R2-D2 for my neighborhood. C3PO is waaay to chatty. Robots so more people lose their jobs? Ludicrous! Which is exactly why HAND MADE things will become even more valuable. It's the only thing robots can't do. Re-hire them at half the rates with no pension. Postal rates are far too high and are killing online sales. Sack all the managers too. Just deliver 3 days a week.